Home / Templates and Themes / Sunday Freebie: Elegant Print Templates! Sunday Freebie: Elegant Print Templates! Create your unique identity with today's deal. Go for this traditional but inexpensive way to promote and advertise your Brand. Links for free fonts in *.txt file. 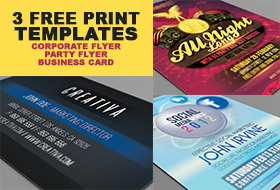 Grab these Free templates to create an effective promotion for your Brand. Cannot make them available for free. Ready to grab this Freebie Today?